There were nearly 2m visits to Scotch whisky distilleries in 2017, with spending topping £60m and breaking all previous records, according to the Scotch Whisky Association (SWA). The SWA’s annual survey of visitor centres reported 1.89m visits to Scotch whisky distilleries last year, a rise of 11.4% on 2016 – and 45% up on the figure from 2010. Visitors spent a total of £60.89m, a rise of 15.6% on 2016, while spend per head rose 3.8% to £32.22, the survey showed. The highest number of visitors came from Germany and the US, followed by India, China and Japan. Meanwhile, the economic impact of tourism in the Moray region – which includes Speyside – rose 9.6% in 2017 to reach £128.9m, according to a separate study from Moray Speyside Tourism. Visitor numbers to the region were up 7.4% to more than 800,000, with a surge in interest in whisky one of the key factors behind the increase. ‘Speyside has the highest concentration of whisky distilleries in the world, and we know that three out of five visitors to our beautiful region go to a distillery,’ said James Johnston OBE, chair of the Malt Whisky Trail. Karen Betts, chief executive of the SWA, said the record figures from the SWA survey were ‘great news for the industry and great news for Scotland’. According to the SWA, distilleries have invested more than £500m in tourism over the past five years, including the opening of Macallan’s new £140m distillery and visitor centre. Meanwhile, Diageo is spending £150m on a Johnnnie Walker tourist attraction in Edinburgh, and on renovating its 12 distillery visitor centres. The company said earlier this year that those visitor centres attracted 440,000 people in 2017, up 15.2% on 2016. Soaring growth in whisky tourism is paving the way for a new generation of Scotch distillery. 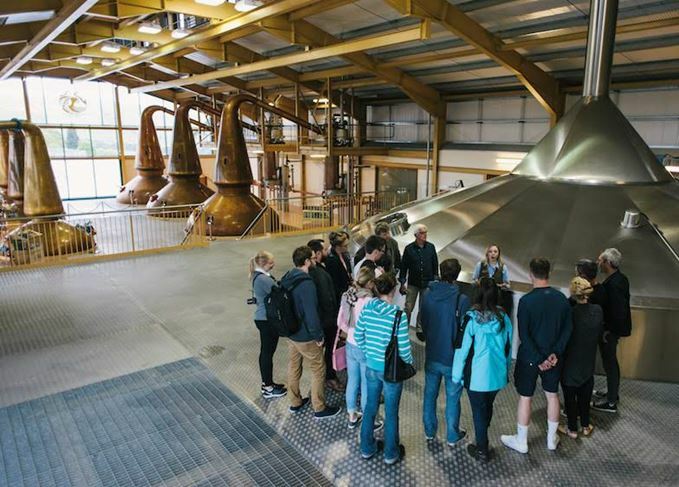 Business is booming for whisky tourism, as Diageo’s visitor centres see a rise of over 15%. Scotch distilleries attracted a record total of 1.6m visits in 2015, up more than 20% on 2010. The 60-mile trip involves cycling and kayaking to every distillery on Islay and Jura in three days.